I think that audiences must have been shocked to see Laurence Olivier, the embodiment of classical British theater, who had become the undisputed Master of Shakespearean roles (with John Gielgud as his only really serious rival), as the lead in The Entertainer, the sordid story of a third-rate song-and-dance man. Yet it's a testament to Olivier's extraordinary talents as an actor that in this role, he created a character as iconic as his Richard III or Henry V. The Entertainer gives us a side of Olivier in terms of acting that I don't think perhaps even he was fully aware he was capable of. We also see early work by three other actors who would go on to long and respected careers themselves, which is an added bonus in this tale of woe. Archie Rice (Olivier) is in dire financial straits. A vaudevillian when the musical hall tradition is dying out to television, Rice has never been the success that his retired father, Billy Rice (Roger Livesey) was in the heyday of the musical hall era. Still, Archie Rice keeps plugging away with his quips and dance numbers, despite smaller audiences and bigger bills. He keeps the show going despite the fact he has no money and has been successful at evading the tax man for near-on twenty years. Rice's troupe is starting to rebel, but Archie has a few other things on his mind. First, one of his two sons, Mick (Albert Finney, Newcomer Num. One) has been sent by the Army to the Suez at the time of the Suez Crisis. Second, his daughter Jean (Joan Plowright, Newcomer Num. 2), who opted out of the family business, is concerned for both her brother and father. She's a social worker who wants to make a difference but her engagement to Graham (Daniel Massey) is on the rocks. He wants to take a job in Africa, but she doesn't want to change her career or move far from her family. She goes to visit her family where Archie is doing his show. Her stepmother Phoebe (Brenda De Banzie) is fond of her and her brothers Mick and Frank (Alan Bates, Newcomer Num. 3). She worries constantly about the whole family, and soothes her anxieties with alcohol. Frank, who is Archie's music director, thinks well of his father though Frank is dismissive of his own talent (he supplements his income by playing organ at movie houses and dance halls). He is either oblivious or unconcerned that Archie fools around on Phoebe quite a lot, something both Phoebe and Archie are aware of. Archie is desperate to mount a new show at the Winter Garden, but his name and style isn't a draw. Archie's fortunes, however, appear to take a turn for the better when he is a last-minute replacement at a bathing beauty contest. The second-place winner, Tina (Shirley Anne Field), dreams of a theatrical career, and thinks the smitten Archie may be her way in. Archie thinks Tina is perfect...at least as far as her wealthy parents are concerned. They're the perfect people to fund his new show. The fact that Archie's begun an affair with Tina isn't shocking. Not even the fact that she's just twenty is shocking. It's the fact that this is the first time Archie's seriously considered leaving Phoebe and marrying her. This is too much for Jean, who discovers Archie's dalliance. She goes to her grandfather, who in turn contacts Tina's parents to tell them the truth about Archie. It was a poor decision, as Archie's already spent the money and now has nothing to pay anyone with. To attempt to save Archie, Billy agrees to make a 'comeback' at the Winter Garden, with Archie as part of the act, despite Billy's poor health. You can imagine how that went, and it couldn't have come at a worse time for Archie. Prior to this horrible turn of events, the Rices learn that Mick has been killed in Egypt, his funeral having drawn major attention (and perhaps, a bit of a focus on Archie). With Archie having buried his son and his father in rapid succession, it's all over for Archie Rice, song-and-dance man. Phoebe and Frank take up Phoebe's brother's plan to go to Canada and start fresh, but Archie opts to face the music. As Jean watches her father sing and dance one last time before the show's closed and he faces the bankruptcy courts, his theme song, Why Should I Care?, takes on an even more bitter irony. In a career where noble, highborn characters were his forte, Laurence Olivier I think reached one of his greatest performances as this thoroughly common little man ('common' in so many ways). His shtick isn't funny or clever, his song-and-dance routines appear the product of a long-dead era. I think that was the point of The Entertainer, the idea of a man with limited abilities continuing to ruin himself and all those around him due to his refusal to consider anything but himself. There is a scene midpoint at The Entertainer when Archie tells Jean that he is essentially dead. He can smile, put on a show, but there is nothing there beneath his eyes. This monologue of Olivier's is as moving and powerful as the soliloquies of Hamlet or machinations of Richard III. In those, Olivier had to be appropriately grand and noble. With Archie Rice, Olivier had to be vulnerable, broken, momentarily stripped of whatever thin veneer of greatness he held onto. Despite how sleazy Archie Rice is, at the end Olivier's performance makes us sad for this aging, out-of-touch, foolish, desperate man, who gave up so much for nothing and got nothing from all his plans. The other performances are all equally wonderful. Plowright, who would go on to marry Olivier and stay with him until his death while forging her own career, is sympathetic as the loving but still angry Jean (her dressing down of her father a particularly effective piece of acting). In their smaller roles, Bates and Finney leave positive impressions (particularly Finney, who has only one scene). We even see Charles Gray (better known as Mycroft Holmes in the Granada Television Sherlock Holmes series starring Jeremy Brett, as Blofeld in Diamonds Are Forever, or as the Narrator in The Rocky Horror Picture Show) in a small role as a journalist interviewing Archie and Billy Rice. De Banzie is a bit over-the-top as Phoebe, but she also has moments of genuine sloshed anger. Livesey is wonderful as the somewhat dismissive but loving Billy Rice. Richardson made some fine decisions visually. Jean's discovery of her father's newest mistress came from her observing them via a mirror, showing her (and us) just enough without making a big show of it. The advert for Archie Rice's show appears to be deliberately freakish, emblematic of the man's somewhat grotesque nature. 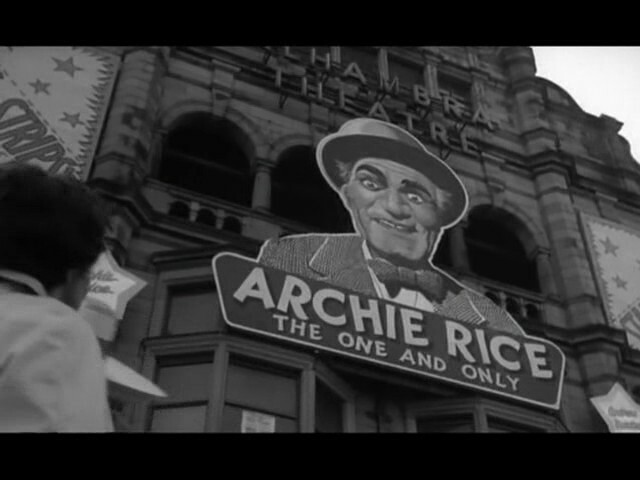 Later on in the film, there is something profoundly sad as this massive sign, with the almost horrifying nature behind the smile, having to look down as Mick's funeral passes by. Richardson doesn't deliberately draw attention to this, but I think he left enough room for the audience to see the symbolism behind it all. I understand that The Entertainer was playwright John Osborne's allegory of the dying British Empire. 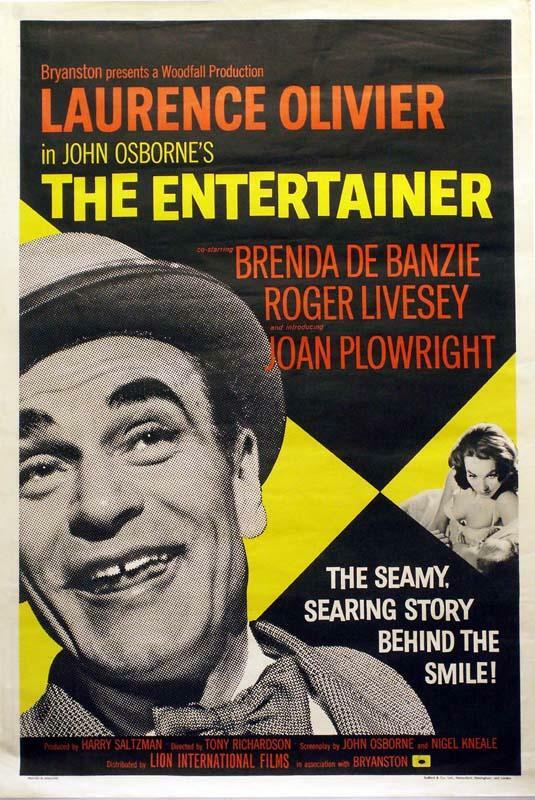 Osborne, who adapted his play with Nigel Kneale, might have had that in mind, but the greatness of The Entertainer is that it can work as allegory and as a straight story. The Entertainer is a tragedy about a man wrecked by his own devices. It has one of Laurence Olivier's best (and I think perhaps now least remembered) performances. I think it has to do with the fact that Archie Rice is as far away from what we think of as "Laurence Olivier" as possible. Still, Archie Rice, this flawed, foolish, failure, is a highpoint of Olivier's extraordinary career. Laurence Olivier...song-and-dance man. Who'd of thought?